Deathgasm is the latest Kiwi produced horror flick to hit stateside. It tells the story of a group of teenaged metalheads (in a band called Deathgasm) who discover the ancient lyrics and staff music from a legendary yet reclusive metalhead named Rikki Daggers. One evening during band practice, they perform the ancient music, metalcore style. Unbeknownst to them, the music puts them into a trance like state inviting demons to possess all people nearby. Death, blood and guts ensue as the demons ravage the quaint neighbourhood. It’s up to Deathgasm to stop the demon takeover. Deathgasm is not good by any traditional or conventional sense. 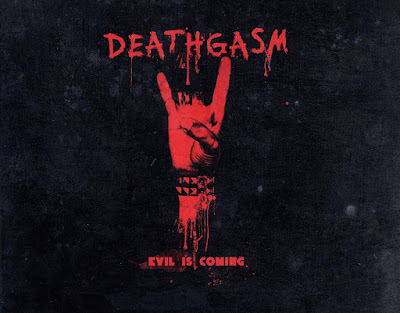 However, if you’re heading into the movie knowing that it’s a horror movie about a bunch of teenage metalheads and demon possession, then you need not look further, because Deathgasm delivers on that front. It’s a niche genre that the niche audience will enjoy; bystanders need not go further. The movie also plays for comedy, and perhaps knowing its audience, it goes for the raunchy type. For me, Deathgasm did what it was supposed to do. There was a bit of a problem with pacing I found. I was hoping for more hits and kicks, but the middle section slowed things down a bit. I think perhaps it was the problem of having to juggle with a number of ideas; those of horror, comedy, bromance and romance all at once. However, where it lacks in story and pacing, it makes up for in its production value. Given the lower budget, the gore factor is high and the little animated signatures in the introductions gives it a fun flair. I didn’t love the movie, but I enjoyed it once, and I don’t need to come back to it. It’s fun for an October release and perhaps more fun watching with a group of friends. Until next time, later geeks!